Andre Claude Marceau, Duc de Remy and Prince d’Aumale, finds Marianne’s joie de vivre enchanting-and her plan for a temporary affair with him impossible. Those Notorious Americans, a family headed by a scandalous robber baron, ready to charm all of Europe with their wit, their good looks…and their fortune. Money can buy anything. Can’t it? When American robber baron Killian Hanniford decides to expand his business empire, he sails to Europe in 1877 and takes his family with him. His two daughters—Lily and Ada—are beauties, accomplished and educated. They want for nothing, except a chance to find husbands who love them for themselves, not their dowries. 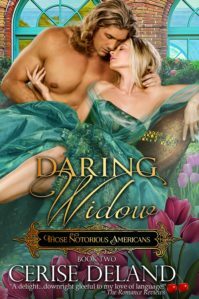 His niece, Marianne, is a charming widow who wants for nothing…except perhaps an amusing and temporary lover. Killian’s son, Pierce, is young, impetuous and too ruthless for any young woman to take on as a husband. Even Killian himself—without a wife for many years but increasingly bored by his mistress—is shocked to learn he can fall in love. Tragic, isn’t it, to learn that money can buy anything… but love? Marianne stood in front of Number 10, her destination. A three-story stone structure with grape leaves carved in relief into the frame, the building had two abnormally large doorways. They appeared to be proportioned to receive a sculptor’s works. The one with a large cut glass window seemed to be the entrance. Inside, the concierge in a somber black suit spied her, hurried out and opened the door for her. “Merci beaucoup.” She sailed through the lobby and up the steps. Four other patrons casually climbed the broad steps. At the top, she halted her in her tracks. A man and woman passed around her. But she stared at the sculpture before her. It robbed her of breath. Here upon a black granite plinth stood a man of white Carrara marble, eight or nine feet tall. All muscle and bone, honed by battle and hewn by strife, massively masculine and robust, he was of such proportions that any other human would fall down in honor of him. He stood in the center of the oval entry to the rest of the exhibit, sunlight from a semicircle of windows shining on him, shadowing the arc of a bicep here and emphasizing the indentation of a deltoid there. Yet he did not stand tall, but was hunched. His back was curled, bowed in new defeat. His hair long and ragged, etched in the pristine marble to invoke its filth, shrouded him to the waist. Ropes circled his torso and hung from his wrists. His noble head hung lax from his corded neck as he stared at the nothingness before him. The beauty of this body was nothing to the grand agony of his face. She gasped at the sight and could not look away. She walked around him and bent to face him. He looked at her, but beyond her. He was blind, in torment. She drew back, aghast once more at the brutal honesty of what she saw. This was a strong man brought low. By loss. By self-destruction. She ached with him. Once proud, dynamic. A man others had once envied and emulated. A man so capable, so honored and now, abandoned by others and most tragically, by himself. She stood for how long she did not know. The power of him infusing her. And the power that he’d lost draining her of envy and inspiring pride at Andre’s talent to portray him so precisely. Across the room, beyond the giant, a young man in an apprentice’s smock tipped his head in question. Not at her. But someone who stood behind her. He tipped his head and, as if on signal, he departed. The hunger she’d felt for months dissipated. She’d be sated now. She closed her eyes, wishing to hang on to this moment when he was happy to see her and she was as delighted to see him. In this slice of time, there was none of her inner conflict, no yearning to find him, see him, laugh with him. There was just satisfaction. But it could not last. Why not tell him the truth? He had asked for honesty and he did not deserve duplicity. He had only told her how he admired her and she had rebuffed him out of…what? Not convention, no. But her own fear to allow such a strong man near her heart or body. Perhaps even her own fear of her outrageous ambitions? She faced him, and oh, the delight to see him again ran through her like cool water after a drought. He was as tall, as magnificent as she remembered him. Perhaps more so, since she had pined for him so badly. He stood against the white marble wall, the gold veins of the stone highlighting the gilded mien of his own long waving hair. He had folded his arms and one leg was casually crossed before the other. He wore a loosely cut black wool suit, a bright vermilion vest, a white linen shirt open to his strong throat and a purple kerchief tied at his neck. Every inch of him denoted the artist at his leisure. He gazed at her with hollow eyes. “Him?” he asked, as if she had insulted him with the question. She knew why. He wanted her to ask about himself. And she would. She would. “He pays for his miscalculation,” he said. She dropped her gaze to the floor, anxiety eating her that they spoke of more than the statue or the Biblical story of the blind man and the woman he had loved so unwisely. “Do you think she pays?” he asked, his deep voice wistful. He led her down a hallway and into a room where he shut the heavy wooden door and drew her into a room crowded with bronzes and plasters, scattered about on tables and shelves. Two ivory overstuffed chairs stood in one sunlit corner near a sumptuous black velvet chaise longue. Cerise is a participant in the Amazon Services LLC Associates program, an affiliate advertising program designed to provide a means for sites to earn advertising fees by advertising and linking to amazon.com. Amazon and the Amazon logo are trademarks of Amazon.com. If you purchase a book listed on the site from Amazon.com, she’ll earn a small commission. Thank you!